When protestors kept 200 workers from Rio Tinto hostage in their own mining site, including the boss of Rio Tinto in Madagascar, a mining conflict reached its boiling point. The military reaction has assured further unrest in the foreseeable future. Rio Tinto is a leading international mining group. Rio Tinto’s business is finding, mining and processing mineral resources. Major products are aluminium, copper, diamonds, coal, gold, industrial minerals, and iron ore. QIT Madagascar Minerals (QMM), which is 80% owned by Rio Tinto and 20% owned by the Government of Madagascar (represented by the National Mine Office OMNIS), has built a mineral sands mining operation near Taolagnaro at the south-east tip of Madagascar, supported by the World Bank. It is one of the largest single investments in Madagascar ($1000M).Rio Tinto began exploring the Anosy region in Madagascar in the late 1980s. This is one of the most ecologically diverse regions of Madagascar, but also one of the poorest and most isolated. 92 per cent of Anosy inhabitants live below the poverty line (US1$/day). Rio Tinto/QMM intends to extract ilmenite and zircon from heavy mineral sands over an area of about 6,000 hectares along the coast over the next 40 years. The ilmenite mined in Madagascar contains 60% titanium dioxide making it higher quality than most other global sources. The raw material will be upgraded to produce a new 90% titanium dioxide chloride slag suitable for global titanium feedstock markets for sale as a raw material to titanium pigment producers. The pigment is used as a white finish in paints, plastics, paper and dyes. The Rio Tinto/QMM project got the “go-ahead” from Rio Tinto in August 2005 and construction started in January 2006. It displaced local people from their land and requires the removal of rare fragments of coastal littoral forest and heathland found only in Madagascar. Many local people have little or no knowledge of the dramatic changes taking place and the reasons for them. Differences of understanding about the project have already led to conflict and mistrust, which have been further compounded by the lack of communication. The social, environmental and economic upheaval caused by the project affects different stakeholders in different ways. The most important direct negative biodiversity impact resulting from Rio Tinto/QMMs activities is the loss of littoral forest habitat at Mandena, Petriky and Sainte Luce. Approximately 1,665 ha are expected to be lost to dredging, which entails not only clearance of vegetation, but also removal of soil and its constituent seed bank. In addition, many social conflicts were identified and observed on the ground. Property prices and rents have increased dramatically along with the cost of food, medical treatment and energy. Inflation has severely affected the livelihoods of most Taolagnaro inhabitants and some long-term residents were leaving town. People from several areas in the “impact zone” of the Rio Tinto/QMM mine have been demonstrating in 2013 (January 9th to 12th). The main flashpoints have been outside the “Phase 3” camp where many of the Rio Tinto/QMM workers from outside Taolagnaro (and some who originate from there) live. They have been also demonstrating close to the Mandena access road crossroads. The protesters include people from areas around Taolagnaro (Ehoala, Mandena, Ilafatsinana) evicted from their land for port, mine, and road construction early in the mine process. There are also villagers involved in the protests from the Sainte Luce area where the company are starting the build up to initiate the second mine site. Allegedly there are also people involved from Manantenina where Rio Tinto have an early stage bauxite mine in preparation. Hundreds of protesters blocked roads for several days and trapped 200 Rio Tinto/QMM staff including the country’s chief executive. Rio Tinto allegedly threatened to shut the electricity to the town off if the authorities don’t sort the problem. According to the Telegraph (January 24th), they even threatened to exit Madagascar. On January12th, the military showed up, started firing tear gas, and then handcuffing, beating and dragging protestors along the tarmac. A number of military personnel were injured in revenge attacks. There are many reasons why local people in Taolagnaro are disgruntled. 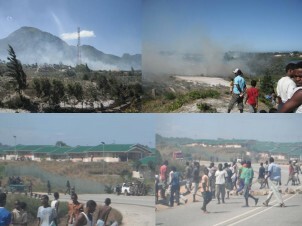 It seems however that the spark for the latest round of demonstrations is that, according to the protesters, the company brought in four bus loads of manual labourers from the highlands of Madagascar. There is currently huge inequality in Taolagnaro, with a significant population of people from outside the region in comfortable positions in Rio Tinto/QMM and associated companies, and relatively little opportunity for simple local people to gain employment. So the protesters demand the company employ more locals. Also, according to the area chief for Anosy, 400 hectares of land were sold to build Rio Tinto/QMM’s mine in 2006. The plots went for between 100 and 6,000 Malagasy ariary (£0.02 and £1.65) per square kilometre to different owners. The first sellers now demand at least 3,000 Malagasy ariary per square metre. 1 Vahinala Douguet is ecological economist with a PhD from the University of Versailles Saint Quentin. She is an EJOLT’s collaborator and is currently conducting an inventory of the environmental injustices in Madagascar, mapping environmental conflicts in Madagascar. They stole the land. The CEO should go to prison, the company should lose their charter, and the proceeds from the dissolution should go to reimburse the people from whom the land was stolen. There’s absolutely no excuse whatsoever in the 21st century for this sort of institutionalized psychopathy. L’argent ne profite évidemment pas aux locaux mais à la clique au pouvoir à Tana. Eux peuvent s’acheter des 4×4 neuves et envoyer leurs enfants faire des études à l’étranger. Tout est bon pour le profit immédiat. Il n’y a qu”à constater où conduit l’exploitation du bois de rose sur le nord-est ou du quartz, etc…dans ces derniers cas, la demande vient de Chine.C’est leur real politique à eux, elle ne connaît aucune barrière écologique.